Arriving in Hermiston at 6:20, we had a short 10 minute wait before the next leg of the trip began. 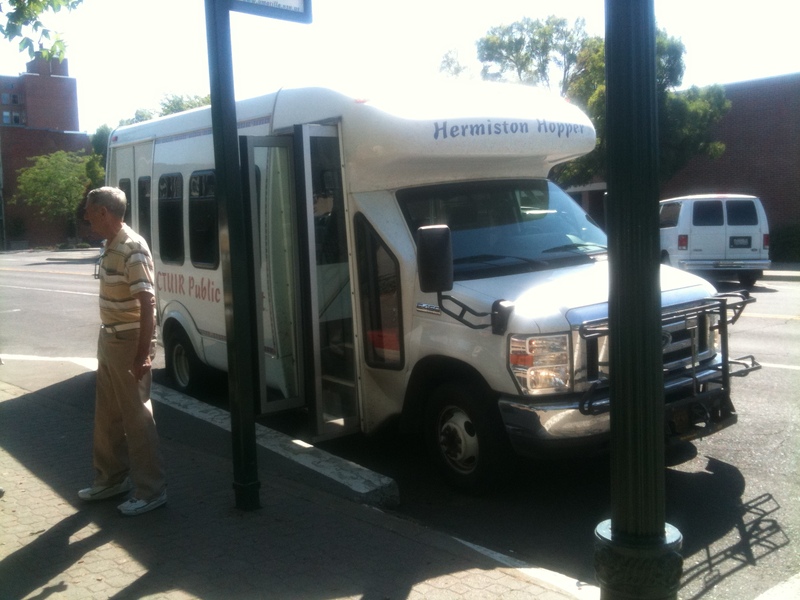 Unlike the low ridership we saw on the Tri-City Trolley, the Hermiston Hopper had a full-load before we’d even left the Hermiston stop. When we made it to Stanfield, a few people disembarked, but even more boarded, leaving one fellow stuck with sitting in the back in the wheelchair securement area. The same thing happened as we passed through downtown Pendleton where one more person disembarked and more got on. The fellow who got stuck without a seat sat down in the stairway until someone else got off the bus, leaving an empty seat next to Old Man Jenkins. Once we made it out of downtown Pendleton, the bus started serving the stops for CTUIR facilities, where the majority of the riders started disembarking. Most got off at Cayuse Technologies, the key tenant of a business park the tribe has been trying to develop. We got off the Hermiston Hopper at the last stop of the route, Arrowhead Travel Plaza. This time, we had a bit longer of a wait. An hour and a half to be exact. The good thing was that the truck stop has a McDonalds with power plugs. Finally, to get to Walla Walla, we had to wait for the Walla Walla Whistler. Somewhere along the way, the bus that normally runs the Walla Walla Whistler broke down, which meant that the bus that runs the Hermiston Hopper had to fill in. A little weird, but a bus is a bus, so it all works out. It was just us and a kid who’d boarded in downtown Pendleton when we first left Arrowhead, but in Weston, we ended up with about 10 people aboard. Things got a bit sketchy after we left Weston, when we encountered some slow moving farm equipment on the highway, which made the bus operator a “bit” antsy. Luckily he didn’t cause any accidents, but at the very least, passing on a double yellow is still illegal the last time I checked. Eventually we did make it into Walla Walla, only 8 minutes or so late. Once in Walla Walla, we spent time seeing the sites, from Hot Poop to Whitman College and so on. As well, we got some pictures of the local transit agency, Valley Transit, along with some other agencies that have service to Walla Walla. 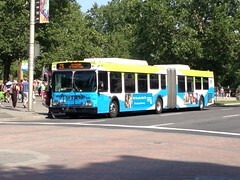 Valley Transit has 12 of these in their fleet (#1-#12), with 11 running routes during regular service and 1 in reserve in case a bus breaks down. Another trolley passing by the historic Baker Boyer Bank building. 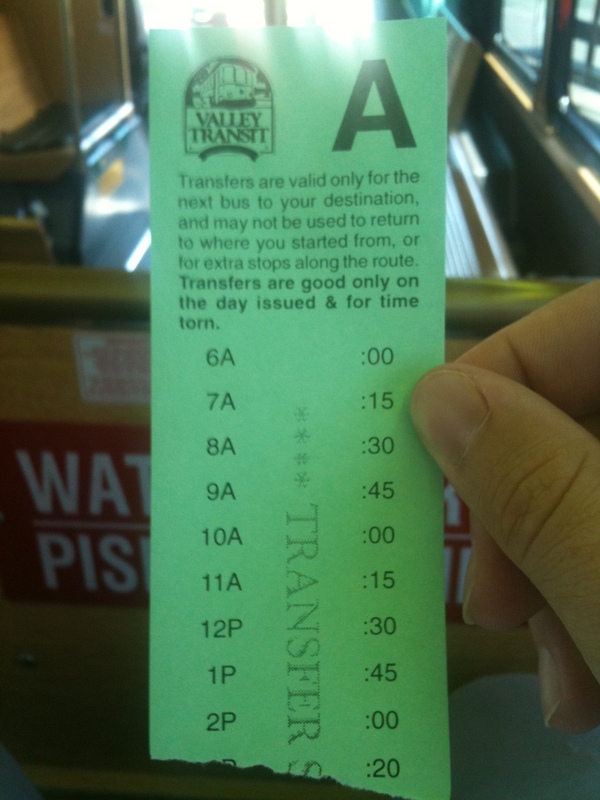 I’ve been on Valley Transit several times before, but I’ve never actually tried using a transfer slip on their buses, so it was a bit of a learning curve. We got these transfer when we boarding Route 3 at WWTC, disembarked at the corner of S 2nd Ave and W Tietan St, and then walked west on Tietan and boarded Route 5 at the corner of Milburn Dr and S 3rd Ave. We had to flag down the bus on Route 5 since there were no bus stops that we could see and the bus was literally right there. (I later saw that there was a stop a block up 3rd Ave.) When we boarded the bus, the bus operator bluntly told us that we weren’t allowed to use transfers in this circumstance, but he was going to let it slide this time. On the Valley Transit website, the listed policy for transfers is this: “If one bus cannot get you to your destination, a free transfer will be issued upon boarding the first bus to get you to another bus. Transfers are free and valid within the hour. Transfers may be used anywhere routes intersect, but cannot be used for a return trip.” Since we were on a “return trip” towards WWTC, the bus operator was correct in what he told us. My only complaint is that the policy wording is pretty vague, and leaves room for abuse of the rules. Also, though I wouldn’t necessarily call myself an out of towner, but I do think tourists might be thrown off a bit by this policy. The good thing though is that a Valley Transit fare is only $0.75, so it’s not a huge deal in the long run. The thing I like about Valley Transit is that along with the stop flag, a good number of their heavy-use stops include the schedule and route information. For this particular stop, information for Route 1, which serves the stop during regular Monday to Friday service, and the East Loop Route for Evening/Saturday service is included. Valley Transit does a good job with the few stop shelters that they have, as they make sure that it has all the amenities that a good stop shelter should have. A lot of small rural towns don’t tend to have public transporation. The City of Milton-Freewater, Oregon bucks that trend though. Though it is a small operation with a small vehicle (An ElDorado “VersaShuttle” on a Ford E-350 chassis to be exact), it works. 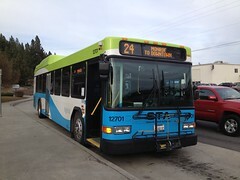 It has 3 runs a day, the first starting at 7:50AM and the last at 12:50PM, where it serves destinations throughout the city, and then runs up to Walla Walla with service to both hospitals and the VA Clinic, finally connecting to Walla Walla Transit Center and then heading back to Milton-Freewater. (More info about the schedule here.) One of the most impressive things though is that it was among the first agencies in the Pacific Northwest to be on Google Transit. Not bad for such a small city. 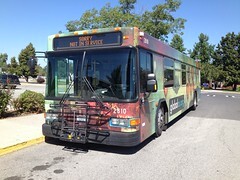 Columbia County Public Transportation, one of the smallest transit agencies in the state. (I think only the still-unnamed PBTA in Whitman County is smaller.) During the morning and afternoon hours, CCPT runs this bus from Dayton and Waitsburg to Walla Walla (and College Place if requested) for people to do shopping or head to their jobs or whatever they need to do in town. According to their website, the cost is $7.50 for a round-trip fare, or $5 each way. The last time I was on the Walla Walla Whistler, it was using a cutaway on a GMC Kodiak chassis. As you can see though, the CTUIR got a shiny new bus. More specifically, this is a StarTrans S550 on a Ford F-550 chassis, with 24 seats and 2 wheelchair securement positions. It’s a pretty nice addition to the fleet. One of my favorite bus routes, which runs from Walla Walla to Pasco and back 3 times a day, and has a fleet of 3 different buses. This particular bus, #G3, is a Turtle Top Odyssey XL on a Chevrolet Kodiak C-5500 chassis. It also has two other vehicles like this in the fleet, labelled as #G1 and #G2. When the Grapeline first started, it had two Goshen Coach Connection cutaways labbled as #293 and #294. I’m not sure if those are still part of the active fleet as they haven’t been seen for a long time. To end the day, we took the Grapeline back to Pasco, connected to our original starting point at Huntington Transit Center via Ben Franklin Transit’s Night Service, and then headed home. It was a long day, but I would do it all over again.